Traditional in subject matter and experimental in style, the paintings of Ginger Riley Munduwalawala are impressive pictorial presences, not least because of their scale and dramatic colour schemes. As an elder of his community, the artist is entrusted with the preservation of aspects of the stories of his mother's people at Four Arches, 45 kilometres inland from Limmen Bight in the Gulf of Carpentaria.Limmen Bight country is the landscape depicted in this stately retelling of the story of the first being, a kangaroo, shown in solitary grandeur at the bottom of Riley's successively layered composition. In order to populate the world, it was the task of this being to find himself a mate. Garimala, an ancestral snake, recommended he seek out a young girl, a quest which leads the kangaroo into many deprivations and dangers. The near-fatal spearing shown in the second register was probably in punishment for his trespass on the territory of another clan. 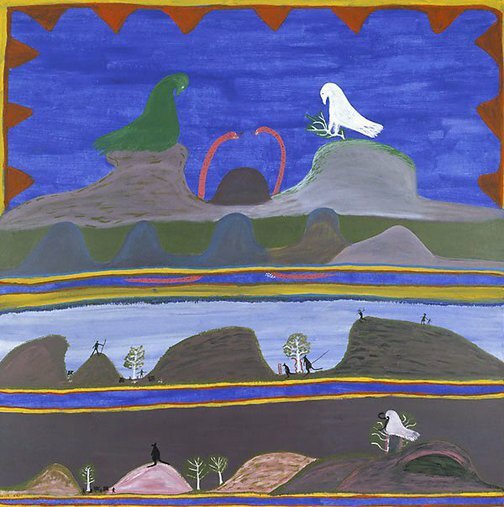 The hump-like landforms which characterise the work, and Limmen Bight itself, are believed to have resulted from the writhings of the great serpents whose appearance in this painting, and elsewhere in Aboriginal art, is significantly hieratic. Signed l.l. corner , red synthetic polymer paint "GINGER RILEY". Not dated. Bruce James, Art Gallery of New South Wales handbook , 'Australian Collection: Aboriginal and Torres Strait Islander Art', pg. 208-241, Sydney, 1999, 233 (colour illus.). Hetti Perkins, Art + soul: a journey into the world of Aboriginal art , 'Bitter + sweet’, pg. 173-265, Carlton, 2010, 242-243 (colour illus. ), 244 (colour illus., detail), 282. Judith Ryan, Look , 'The boss of colour', pg. 16, Sydney, Nov 2002, 16 (colour illus.). Art Gallery of New South Wales: highlights from the collection , Sydney, 2008, 40, 41 (colour illus.). AGNSW Collections , 'From Colonialism to late Modernism', pg. 7-106, Sydney, 1994, 104 (colour illus.). The Art Gallery of New South Wales Bulletin , 'Yiribana Aboriginal & Torres Strait Islander Gallery', pg. 6-9, Sydney, Apr 1995-May 1995, 8 (colour illus. ).